Jack Cole (Seagal) is a New York cop and snappy dresser who transfers to L.A. when a serial killer begins terrorizing the city. Known as “The Family Man” because he slaughters the whole family, and does so also with a religious subtext, the stakes are high for Cole and his new partner Campbell (Wayans) to crack the case. The heat really ratchets up when Jack’s ex-wife becomes a victim, and our two heroes discover that the Russian mafia is involved in all this somehow, as they usually are in these instances. As it turns out, Jack’s CIA past comes to light as his former boss and now bad guy Mr. Smith (Cox) has joined forces with another local baddie named Deverell (Gunton). Things may seem complicated for the seemingly-mismatched pair of Cole and Campbell, but the Buddhist monk and the wisecracking cop are the only hope of rescuing the citizens of Los Angeles. Will they succeed despite all the obstacles in their way? 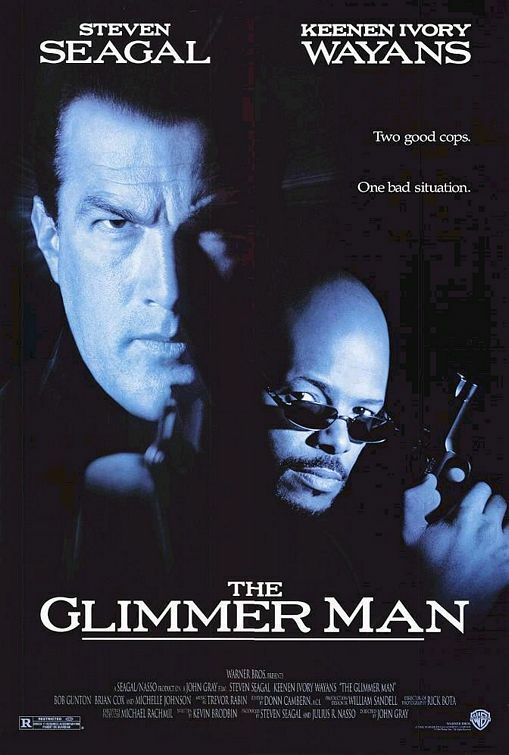 Prepare to soak up the awesome power of glimmering men as Seagal eats his way through L.A. like a pudgy Pac-Man. It seems pretty clear that the filmmakers were trying to replicate the magic of The Last Boy Scout (1991), even throwing a Wayans brother into the deal. But without the stellar writing of Shane Black, or a comparative budget, or the charisma of Bruce Willis, you’re left with a Seagal on the decline…this is where his laziness started to become really apparent, with face-palmingly obvious stand-ins, other actors overdubbing his voice, his whispering when he does have to talk, and the predominance of his paddy-cake slap-fu during the non-gun-related fight scenes. Oh well, at least this is before he became a sadistic torturer, as he did in his later DTV movies. Keenen Ivory Wayans not only shined with his great comic timing and snappy one-liners, we also appreciated the fact that his character, Campbell, was a classic movie fan. He even got to do some impressive Keenen Ivory-Fu, which was much appreciated. 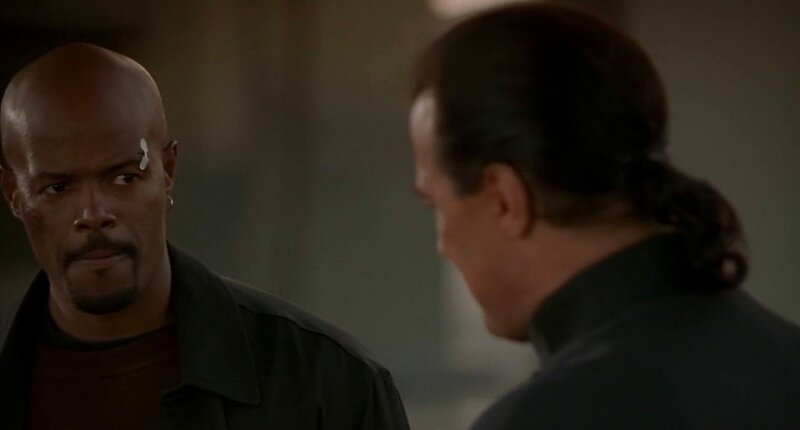 Not only did Wayans pull his own weight in this production, he pulled most of Seagal’s as well. Without Wayans adding the brightness, this would have been a total slog. Brian Cox was perfectly fine as the baddie, but it was very reminiscent of Noble Willingham in Boy Scout. When Cox and Seagal are talking in the Italian restaurant, it’s a battle of the whispers. You definitely need the subtitles on the DVD. So while we do see the triumph of Seagal’s so-called “sissy beads”, the movie remains just on the edge of a breakthrough of quality and value. It’s entertaining enough, but it’s also easy to see why it was one of Seagal’s last movies to hit theater screens. 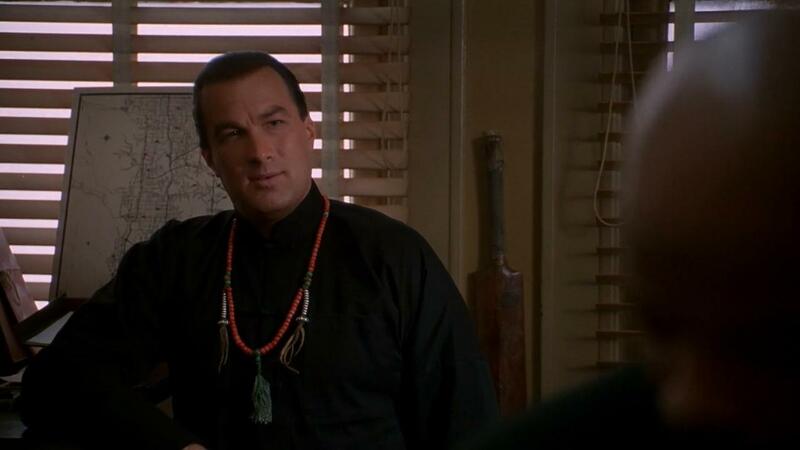 Speaking of edges, you haven’t seen the proper use of a credit card until you’ve seen Seagal brandish his plastic. I hear he earns double airline miles for every dead gangster. 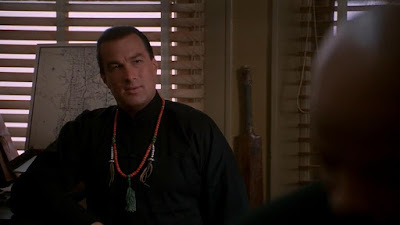 Once again, Seagal was also heavily involved in the music, teaming up with the prolific Todd Smallwood on two bluesy rockers for Taj Mahal and The Jeff Healey Band. Music aside, the plot is nothing you wouldn’t see on an episode of Criminal Minds, and it’s plain to see Seagal’s torpor setting in. Taking all this into consideration, The Glimmer Man might bring back some fond memories of perusing the shelves at your local video store…but seen from today’s perspective you can see the ill omens that would predict the course of Seagal’s later career. Despite the best efforts of Wayans and perhaps a few others, The Glimmer Man is pretty middling. I actually saw this in a half-full (or half-empty) theater, depending on whether you’re an optimistic or pessimistic Seagalogist. It was like a combination of a Silence of the Lambs rip-off and a typical Seagal slapfest, one could perhaps call it Silence of the Seagulls. It’s not one of the best Seagals, but it has slick cinematography and a few action scenes, like you expect from a studio movie. 2,5 stars is accurate. Absolutely agree with your comment. Haha love the slapfest bit too. It does have some cool moments especially the knife in the credit card scene.